Teaching toys are essential in learning. Is your child ducking and turning away from your camera? We believe that a "good" toy graduates to a "great" toy when it has the ability to entertain and instruct a child at the same time. Whether your child is ahead of schedule or has experienced some delays, a toy that helps teach a child to look at the camera comes in handy. So many toys...so little room in the car! 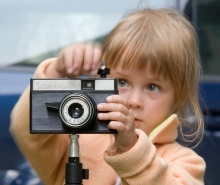 When your child first starts to learn about what a camera is, experiment with some photography props that are engaging and lively toys to help a child look at a camera. They can be a big step toward learning to take pictures. Visual stimulation and any bright colors or unique shapes can be helpful. Rattles, teething rings, mobiles and your finger movements have undoubtedly opened up their senses and have helped them to learn. Toys that help develop what the professionals call the "cognitive skills" of perception, awareness, causation and reasoning are important to the next levels in development. In other words, when their brain is developing...help them to develop it! The top on our list of toys is a "Birdie" that can help make a connection to your camera and to help them understand what a camera does. The birdie can also help breathe more life into the cameras you have not been using either through renewed interest in photos or with pretend play with old cameras. In the early stages of language skills, a birdie will help connect the classic "watch the birdie" phrase from back in the day and "saying cheese" as they begin to comprehend and appreciate the importance photos will have for your family and their history. Imitation is the best learning tool so it is important that you remember how to have fun too! Choosing the right teaching toys just might hatch a "fledgling" photographer. One day when they have left your "nest", they can look back fondly on how you had given them a boost in learning how to act and become relaxed around a camera for the rest of his or her life.